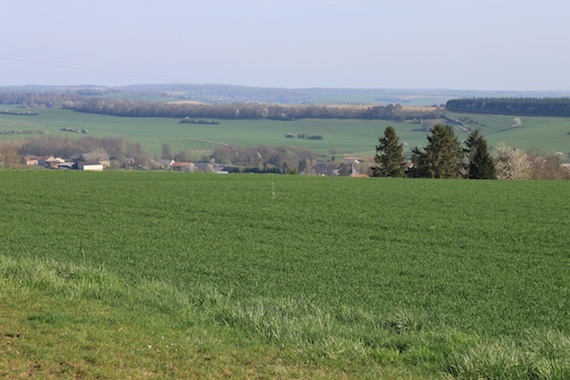 View from the fields around Bulson down to the valley of the Meuse. I’ve just returned from a recce trip to the area around Sedan and the Ardennes in eastern France and southwestern Belgium. I was retracing, as much as I could, the route that German Army Group A used in May 1940. And I was struck, once again, at just how risky the German operation was – and how Hitler staked everything on Army Group A making a successful dash towards the French coast and trapping Allied forces north of them. The Germans succeeded, of course, and the result was the defeat of France and the evacuation of the British at Dunkirk. But it could so nearly have been otherwise – and then the war would have ended less than a year after it had started. A crucial reason why the Germans were able to push so quickly into France was the quality of troops who were opposed to them. The best French troops were fighting – and fighting for the most part valiantly and well – to the north, in Belgium. But the troops left around Sedan were just not up to the job. And if you ever want an example of just how important morale is in war, then look no further than the story of the ‘panic’ caused by false reports from a French artillery battery on the evening of 13 May 1940. They – wrongly – reported that German tanks were at Bulson, a village on a plain above Sedan and the river Meuse. The consequence was widespread desertion. Many French troops just ran away. By the next day the whole of the French 55th Division had simply disintegrated. And it took French troops in May 1940 to prove this French General right. Just come upon this fascinating site. Great.